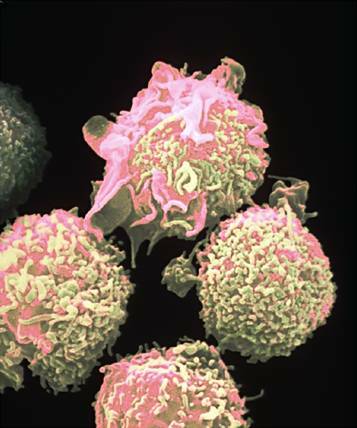 HCL is caused by the abnormal growth of B cells. The cells look "hairy" under the microscope because they have fine projections coming from their surface. HCL can lead to low numbers of normal blood cells. The cause of this disease is unknown. It affects men more often than women. The average age of diagnosis is 55. During a physical exam, the doctor may be able to feel a swollen spleen or liver. An abdominal CT scan may be done to evaluate this swelling. A complete blood count usually shows low levels of white and red blood cells as well as platelets. Blood tests and a bone marrow biopsy can detect hairy cells. Flow cytometry or a test called tartrate resistant acid phosphatase (TRAP) can confirm the cancer diagnosis. Treatment may not be needed for the early stages of this disease. Some patients may need an occasional blood transfusion. If treatment is needed because of very low blood counts, a variety of chemotherapy drugs can be used. A drug called cladribine is used. In most cases, chemotherapy can relieve the symptoms for many years. (When the signs and symptoms go away, you are said to be in remission.) Interferon can relieve symptoms but is unlikely to lead to remission. Removing the spleen may improve blood counts, but is unlikely to cure the disease. Antibiotics can be used to treat infections. People with low blood counts will receive growth factors and, possibly, transfusions. Kantarjian H, O’Brien S. The chronic leukemias. In Goldman L, Ausiello D, eds. Cecil Medicine. 23rd ed. Philadelphia, Pa: Saunders Elsevier; 2007: Chap 195. Gene Transcription and Protein congregation.